Padlet is an online bulletin board so to speak. I like to use Padlet to build an online word wall with my computer apps students. Using this online tool has helped my students learn how to collaborate online. 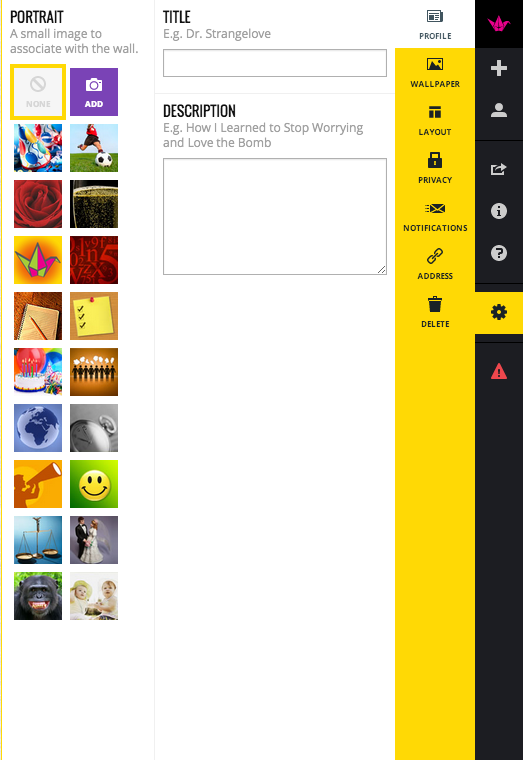 Padlet is very easy to use and very easy to set up. Choose your Layout - Freeform can be posted anywhere on the wall. - Stream posts are posted nice and neatly in a stream. Once you are ready to have your students or teachers post to your wall share your URL (web address) of your wall. The Paper Crane will take you to the "Home" page of Padlet. 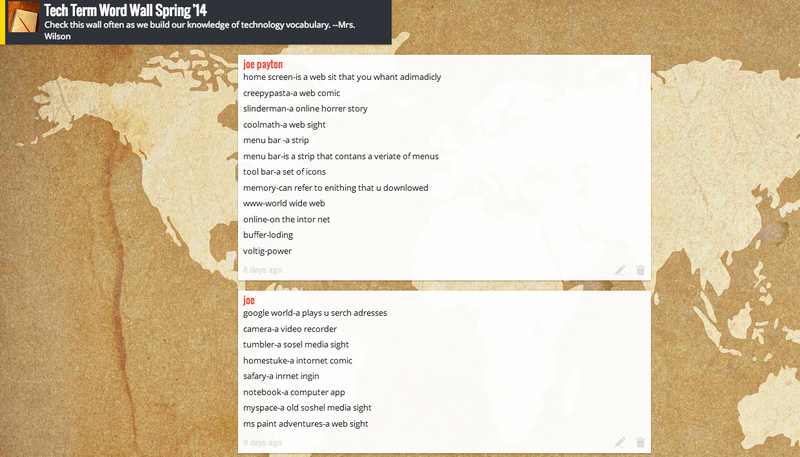 The 4 Squares will take you to all of your Padlet Walls. The + Sign will create a New Wall. The Box with the arrow coming out is to share. To make a post click on the Pencil at the bottom left corner of the wall. One of the tools I used to access students' knowledge for word processing skills is by having them do a simple write up on how they can make their mark on the world. I ask them to show me what they know how to do, add pictures, change font, and etc... This year I added a twist to the assignment. After they finished their write up and posted it in Edmodo for me to view they had to create a LOGO that went with how they plan to leave their mark. This LOGO is no regular LOGO it has an Augmented Reality twist to it. I used the colAR Dot Day coloring page and the colAR Mix app to bring their LOGOs to life. My students really loved watching their LOGO spring to life when they where scanning it via their iPad. I can see using the colAR coloring pages as a spring board for a creative writing projects. 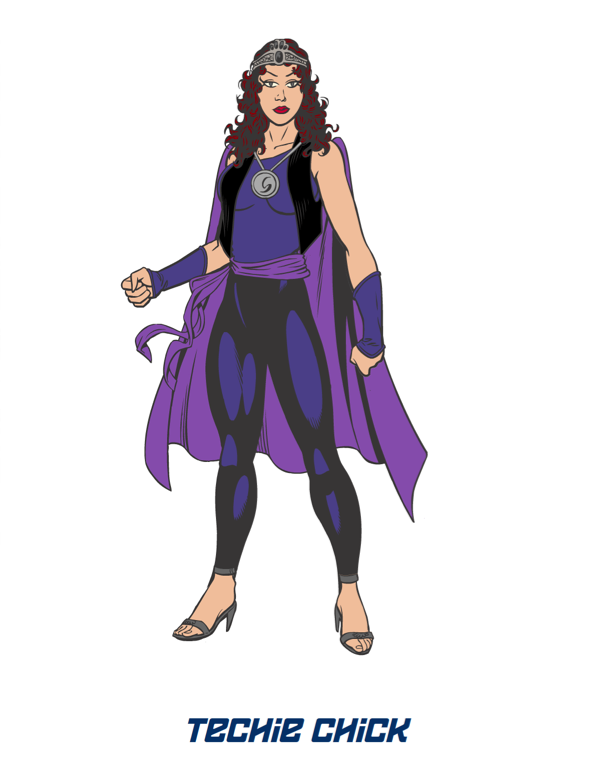 The staff at colAR are adding to their coloring pages some of the pages you do have to pay for and some are free. I try to use the free ones with the kids. 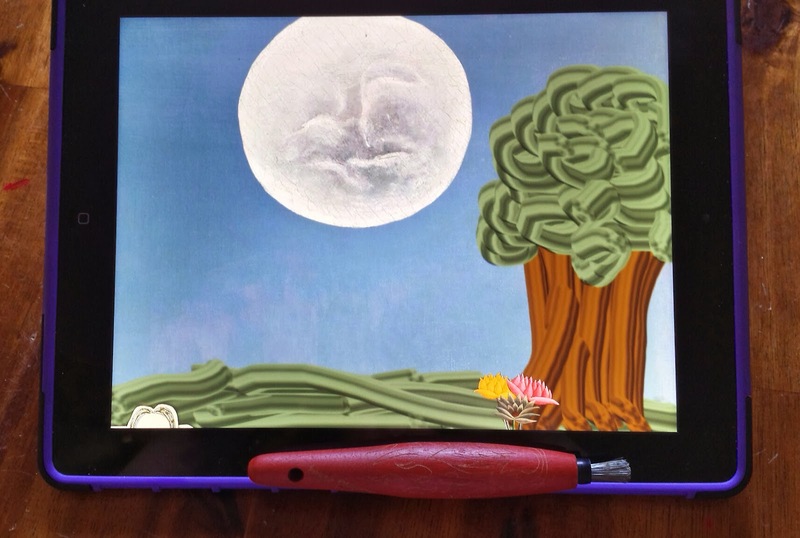 Coloring is not just of elementary students especially if there is an Augmented Reality twist added. 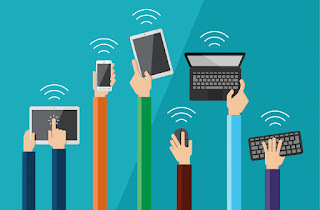 I attended several teched conferences, workshops, and webinars right before school started this year. They inspired me to create a global project. 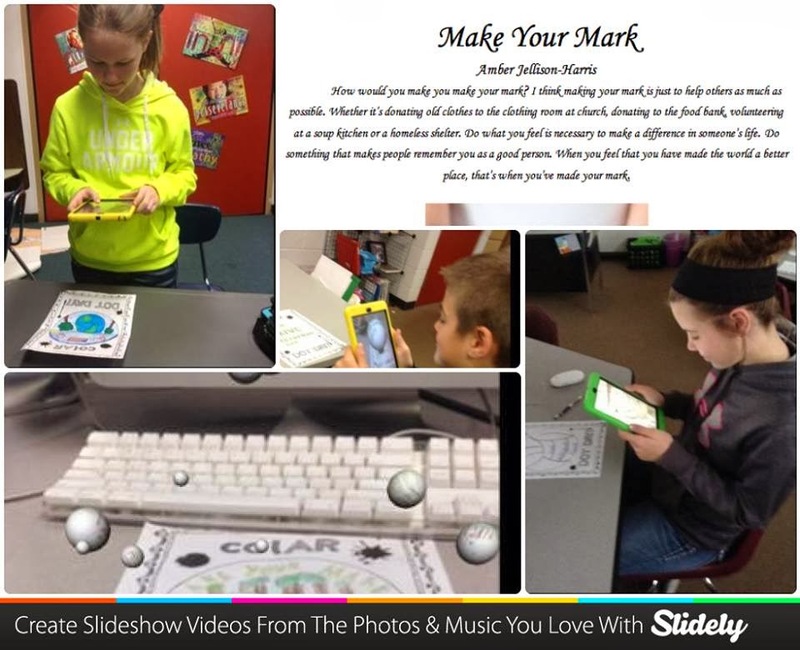 I am really big into scrapbooking and thought how cool it would be to have a living digital scrapbook that students could use to share their stories. I decided to use Edmodo as my platform to connect, collaborate, and to share my dream for my global project. The Global Digital Scrapbook Project for 2013-14 was then born. I created my goals and posted the outcome I wished to achieve with this project. I needed a sign-up form for those who decided to join me on this journey so I created a simple Google Form that I shared with anyone and everyone who would listen to me. By the end of October I had 75 schools from around the world that joined me in this amazing journey. Within our Edmodo Group I created several small groups for students to use to post, collaborate, share, and connect with the other students that were participating in the project. The students can post into groups such as art, economics, culture, school life, and etc.... My favorite group is the Spanish-English group where students can share and learn either in Spanish or English. I did create yet another Google Form for students to fill out and and request to join the small groups. This project has been a huge learning experience. When I started the project I had to be the trainer to the teachers that joined in. Most of them didn't really know how to use Edmodo or had never used it before. I created little video clips to help those that needed it among answer tons of emails and messages. I would like to think it has been a success since it is now February and the communication within the small groups seem to be running smoothly. Some of the ways I've used Edmodo beyond just communicating with the thousand plus students and teachers was holding a LOGO submission for our project. Students submitted their LOGO designs and then I created a Quiz so that kids could vote on their favorite design. I used the Quiz feature because I could add an image to each choice. I also post the "Page or School of the Week" and I am able to see how many times that link has been clicked on. This helps to know if the participates are looking at what I post. Teachers in the project also post polling questions and discussion questions within the small groups. Students then receive either a grade for journaling or participating. We are trying to teach the students not to type in Text talk, write in complete and proper sentences, and digital citizenship all at the same time. Now the goal is to get all of the schools to add something to the Global Digital Scrapbook. Again most of the teachers have not used the website creator I am using to host our scrapbook so I have to put on my trainer hat again. The goal is to have a completed Global Digital Scrapbook by May. I have faith that this will too happen. It takes time to get a thousand plus people all on the same page and understanding what is needed so keep an eye on the project as it grows daily. 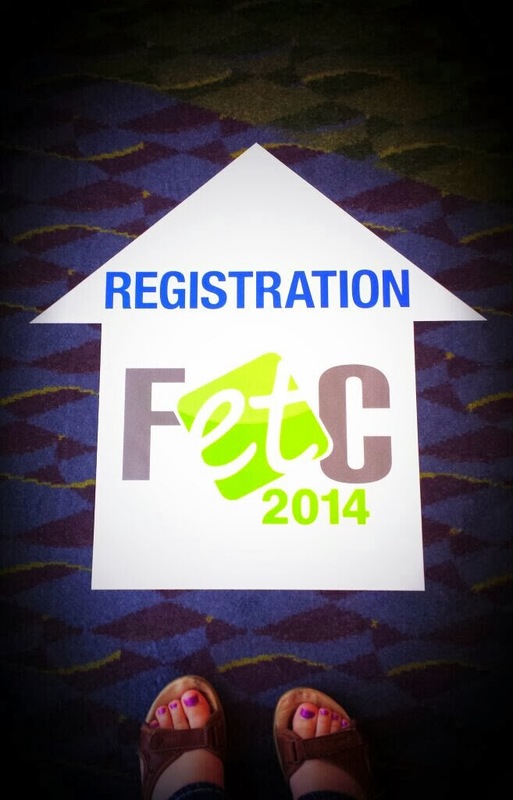 FetC is a national technology educational conference held in Orlando Florida. 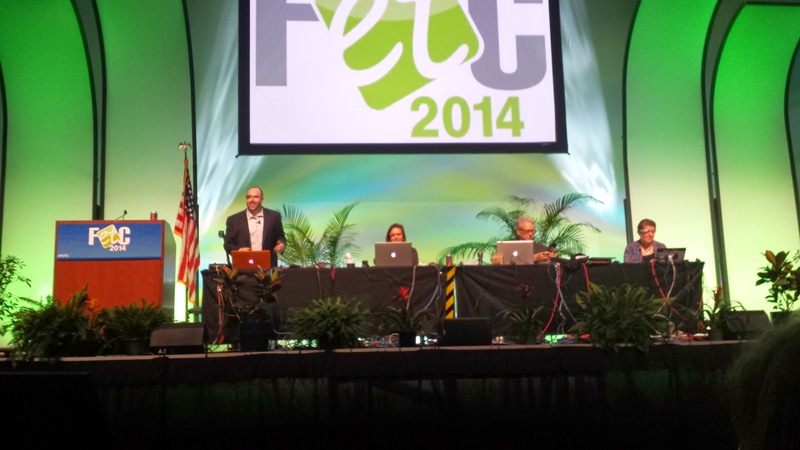 I had the pleasure of attending and presenting at this very energetic tech ed conference. I met some amazing people and learned a lot thanks to a good friend Brenda for letting tag along. My funny take away from the conference was getting a new nickname. When I walked around the conference and even at the airport afterwards people would come up and say Hi Edmodo Spin Girl. I had worked the Edmodo booth throughout the conference. While working the booth I presented about how I created a Global Project using Edmodo. This was the 1st time I did a "Theater Presentation" where people just came in had a seat and listened while I shared. I was a little nervous wearing a mic and having people walking around while I presented, I wasn't used to that. I did make some new best friends but only after attendees spun the prize wheel and then won an Edmodo T-Shirt. I really enjoyed meeting new people and talking with teachers that love and use Edmodo. I tried to answer as many questions as I could, if I didn't have the answer I was glad that the support staff for Edmodo was present to help out. My favorite part of the conference was the TechShare. It was energetic and very informational all at the same time. I walked away with tons of new ideas and apps I wanted to use. Thanks to Kathy I am going to have to get my daughter the Porkfolio, the smart piggy bank. I am also going to have to find someone with a Kinect so I can do the Shapify.me. I think it would be neat to have a 3D figure of me holding my iPad, Smartphone, and Laptop. I also want to try and have my students create an encyclopedia via Wikipedia. This would be a great resource of the content my students use when doing their research projects. I also can't wait to try Flick, where you can flick or share your photos, documents, notes, and even contacts with any devices via the Flick app. As soon as I get home I will be ordering the Nomad Brush, it acts like a paint brush for your iPad. While I was waiting to enter the keynote presentation I was showing teachers some Augmented Reality. 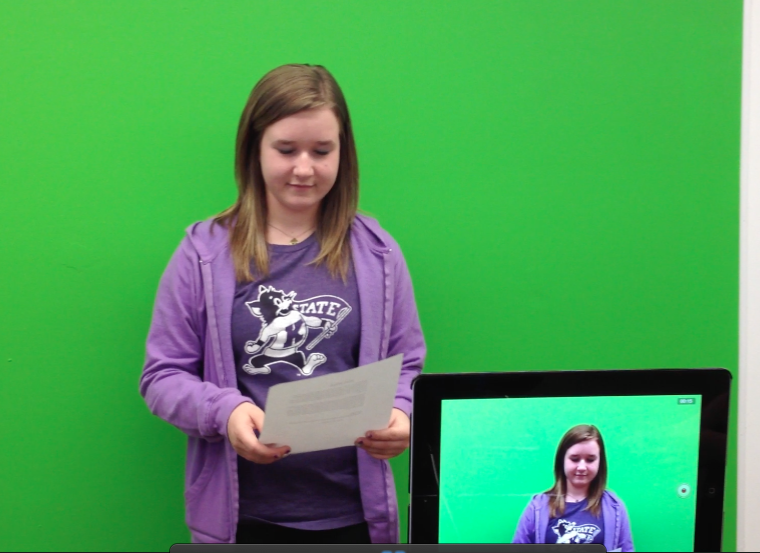 It was fun showing and sharing what I have learned about Augmented Reality. I smiled when someone would come up to me and ask to see my interactive calling card. I had created this calling card to pass out and I had put a spin on it and added an Augmented Reality component. When I get a chance I will be showing my staff the Quixy site. It is a search engine just for apps. TagBoard will be another tool I want to use not only with my staff but also with my students. You can search across social media hashtags. If the slideshow doesn't play Click Here.